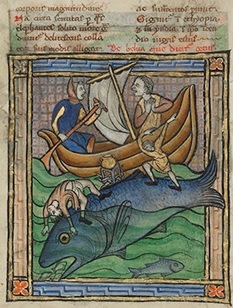 Last week’s shared post about knights and giant snails, written by Nicholas Rossis, inspired me to make a post that features some of the other mythical beasts, strange animals, and human-creature hybrids found in medieval texts. They’re are a lot of fun, and good inspiration for fantasy writers. These bizarre creatures defy all reason; part man, part beast, men without heads, or with the heads of dogs. At times, the grotesque physical deformities can be rather alarming. 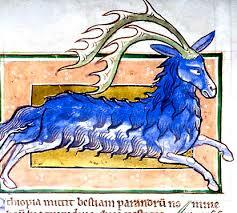 Those listed below are only a small number of the many crazy creatures born from the medieval imagination. With a couple of exceptions, there are more images than writings about these fantastical abominations. Were they visual metaphors to express common beliefs and fears of the day? Or were they thought to be real, lurking in the remote or exotic places of the world? Maybe a little of both. The alerion is lord over all other birds. Bigger than an eagle, it has razor-sharp, fire-colored wings. However, this bird is also exceedingly rare. There is only one pair in the world at a time. The female of the pair lays two eggs when she is sixty years old, which take sixty days to hatch. Once the young emerge, the adult pair are escorted by a host of other birds to the sea, where they plunge into the waters and drown. The accompanying birds then return to the nest to care of the alerions’ young until they can fly on their own. 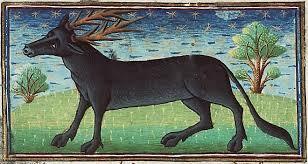 The parandrus (or tarandos) was a beast the size of an ox, with long, dark hair, and the antlers of a stag. It was able to hide itself by changing its appearance to blend in with its surroundings. It is unclear if this creature was supposed to pose any threat, or if its exotic nature and abilities were merely a curiosity. The cerastes is even more flexible than an ordinary serpent, and has horns protruding from the top of its head. There might be two, like those of a ram, or four small horns. A cerastes will hide itself under the sand, with only the ends of its horns sticking up as a lure. When other animals come close thinking they’ve found food, the serpent quickly kills and eats them. Now imagine the possible fantasy adaptations for such a creature. Animals are lured by food…what might lure larger prey, including human beings? Perhaps water in a desert environment…or glittering treasure. Maybe such a serpent would see us as an easy meal. Or with some intelligence it might have a more sinister motive. What do you think? A muscaliet is certainly a strange creature from medieval lore. This small animal has the body of a hare, the tail and legs of a squirrel, teeth like a boar, the muzzle of a mole, and ears like a weasel. It uses the strength of its tail to jump from branch to branch, and its paws for climbing and digging under tree roots. The muscaliet was supposed to have an extremely high body temperature, burning anything it touches. It devastates the leaves and fruit of trees, burrowing beneath the roots, building its nest there, and causing the tree to dry up and die. Ever heard of an aspidochelone? This sea-monster is similar to a whale, but it has spines along the ridge of its back, a turtle-shell, and a head like a snake. The creature masks itself as an island, sometimes even appearing to have rocks, trees, and sandy beaches. It lures sailors to land on its back, then it pulls all the sailors and their ship down into the depths of the ocean where it devours them. 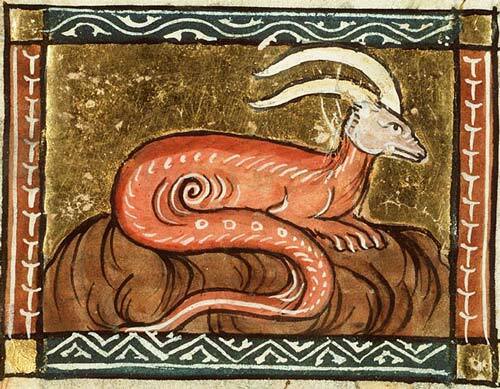 In medieval lore, the aspidochelone was symbolic of Satan, who deceives sinners, and drags them down into hell. No doubt you’ve heard of centaurs, which are generally good and noble creatures. But what about the onocentaur? This beast has the upper body of a man, and the lower body of a donkey. The human half is rational, but the donkey half is wild and without control. The onocentaur is symbolic of lust and the hypocrisy of those who speak of doing good, but who do evil instead. 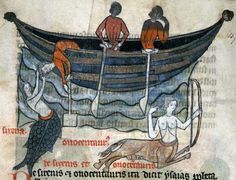 The onocentaur is often depicted carrying a club or bow for a weapon, and is sometimes seen working together with the siren, luring men to their doom. A caladrius is a white bird, typically associated with royalty. Its excrement placed directly onto the eyes was said to cure blindness. But this was not the bird’s only value. 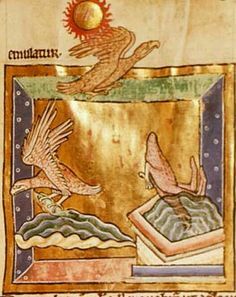 It was also believed that if a caladrius was brought into the room with a sick person, and turned its face away, that person was going to die. 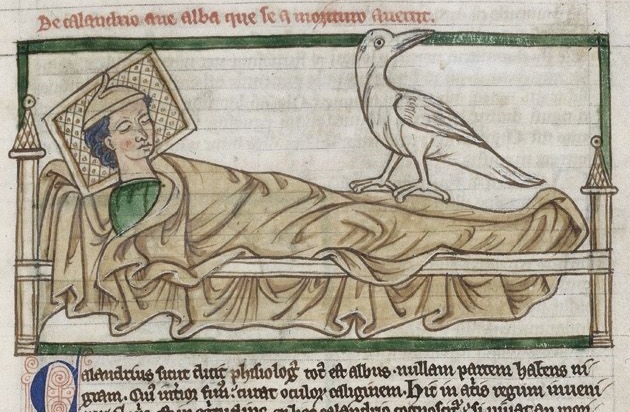 However, if the caladrius gazed into the face of the sick person, he or she would recover. When the bird eventually flew away, the illness would be taken with it. The skoffin is the offspring of an arctic fox and a female tabby cat, and is the Icelandic version of a basilisk. It was a truly evil being that said horribly wicked things, and killed with just a look. A skoffin could only be killed by seeing another of its kind. (In some stories it was tricked into seeing its own reflection.) Later lore claimed that it could also be killed by the sign of the cross or with a silver bullet. Here’s another strange one…a gryllus. This funny looking medieval “monster” has a head and legs, but no arms or body. Its origin is likely in the Odyssey of Greek Mythology, but it frequently graced medieval religious imagery. The gryllus became a symbol of base bodily vices and human folly. Use the Medieval Monday Index to discover other topics relating to daily life in the Middle Ages. I found this fun post by Nicholas Rossis and thought I’d share it today. 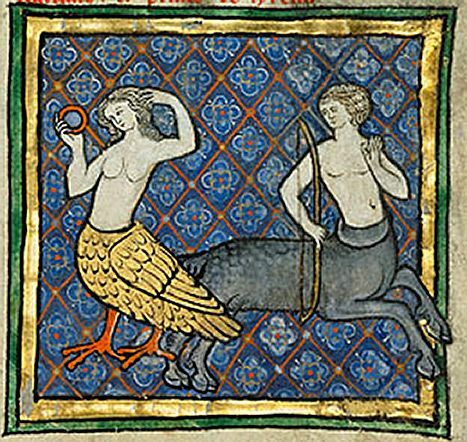 Medieval manuscripts are full of all sorts of mythic beasts, strange animals, and human-creature hybrids. They seem to have been a staple of the medieval imagination. Some of them were actually thought to be real, lurking in distant or unreachable places. Others were merely meant to be entertaining. A good number of them were symbolic and used for teaching lessons and morals. The giant snails? Well, I’m as stumped as everyone else it would seem. But it’s certainly fun to imagine the possibilities. Regular readers will be familiar with my fascination with Medieval manuscripts. I recently came across on Vintage News a detail I wasn’t aware of: that Medieval knights were often pictured fighting giant snails. Scrolls and manuscripts dating back to the 13th and 14th century often contain marginalia–broad margins and blank space that was filled with different notes and drawings (you can read more about them in my previous post, (Medieval-style Doodles, marginalia, and manicules). Funnily enough, gothic manuscripts abound with depictions of an epic snail versus knight standoff. Sometimes the knight is mounted, sometimes not. Sometimes the snail is monstrous, sometimes tiny. Sometimes the snail is all the way across the page, sometimes right under the knight’s foot. 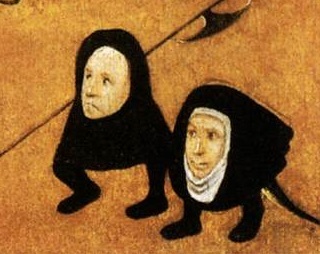 Usually, the knight is drawn so that he looks worried, stunned, or shocked by his tiny foe. So, what was the deal here? Historians have been unable to come to a unified answer. The first serious contemporary study of this odd phenomenon was written in the 1960s by Lillian Randall. In her book The Snail in Gothic Marginal Warfare, she presented one hypothesis to explain the reasoning behind these drawings: perhaps the joke is that snails, what with the shells they carry on their backs and can hide away in, are some sort of parody of a highly-armored chivalric foe. We’re supposed to laugh at the idea of a knight being afraid of attacking such a ‘heavily armored’ opponent. Silly knight, it’s just a snail! Lillian Randall proposed a further explanation that could account for the fact that snails so often antagonized the knights. She proposed that the snail was a symbol of the Lombards, a group vilified in the early middle ages for treasonous behavior, the sin of usury, and ‘non-chivalrous comportment in general.’ However, she could not explain why the knight was always supposed to lose the battle.